I'm a finance nerd at heart and probably should be working in the depths of some investment bank -- but I'm a people person and don't think I could do that for very long. So I've been trying to get my fix via reporting on finance in this blog and I've received a lot of great feedback on the coverage. I'll keep it up. One thing on the blog - if there is something I'm covering too much or not enough, please let me know. And as Bryan Kenna said, please reply via comments on the blog. Your emails are great but other can't see them and build upon them. My first job out of school was doing Mergers and Acquisitions for Hambrecht & Quist in 1999. I caught the tech bubble full tilt and a giant merger I worked on, VeriSign & Network Solutions, was announced a few days before the top in the market. I was caught up in the mania as much as everyone and I still remember the analyst bullpen conversations around trading stocks. 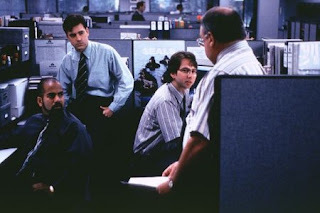 Every once in a while, a VP or Managing Director would drop by the bullpen to see what stock they should be buying. It was an amazing time. So I watched the housing market explode with a sense that "I've seen this before." I'm not smart enough to call bottoms or tops, but I do have a great deal of experience working with debt, from my time at Lighthouse, and I can recognize a debt fueled implosion with the best of them. Well that is what we're seeing right now folks. 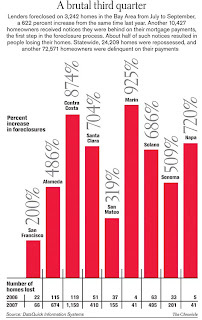 The SF Chronicle details some pretty horrific foreclosure stats from the 3rd quarter. The thing about debt, which housing was dependent on because so many people were putting 0%-10% down instead of the standard 20%, is that it accelerates the pain. When you have an asset that has decreased in value, but you own it free and clear, you don't have to sell. When you only own a portion of that asset, but owe payments, which you can't make, you have to sell...at fire sale prices. The sales, at rock bottom prices, are just beginning. I bring this up because 1) I feel sorry for the folks who are going through this, and 2) The problems in housing are going to affect all of us. If you can't pay your mortgage, you can't shop for the new car, the new tv, mattress or whatever other discretionary item you've been buying the last five years. From most of our perspectives, it's going to be a slow deterioration. For others, it's going to get nasty. I've been through one of these, in Tech, so I know how it feels. Let's try to maintain some empathy and help out those who are going through it.